Coach Delaney-Smith praised the resilience of her team after a tough finish to the Ivy season. After suffering a deflating 91-62 defeat to Penn in the Ivy tournament semifinals, Harvard women’s basketball was at perhaps its lowest point of the season. 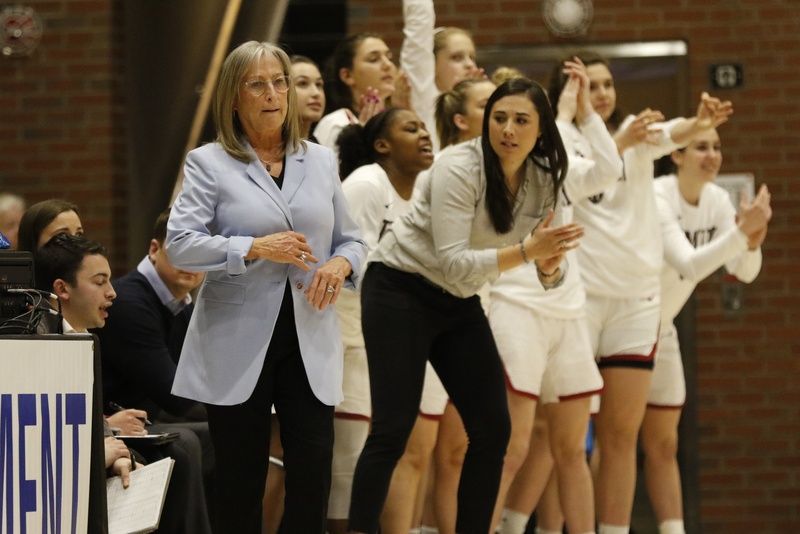 Frustrated and heartbroken to see its hopes at an Ivy League championship crumble, the Crimson nevertheless had to continue to chug on and prepare for WNIT postseason play. In doing so, Coach Delaney-Smith employed a different practice plan. Rather than run through sets or drills, she simply let her team play. 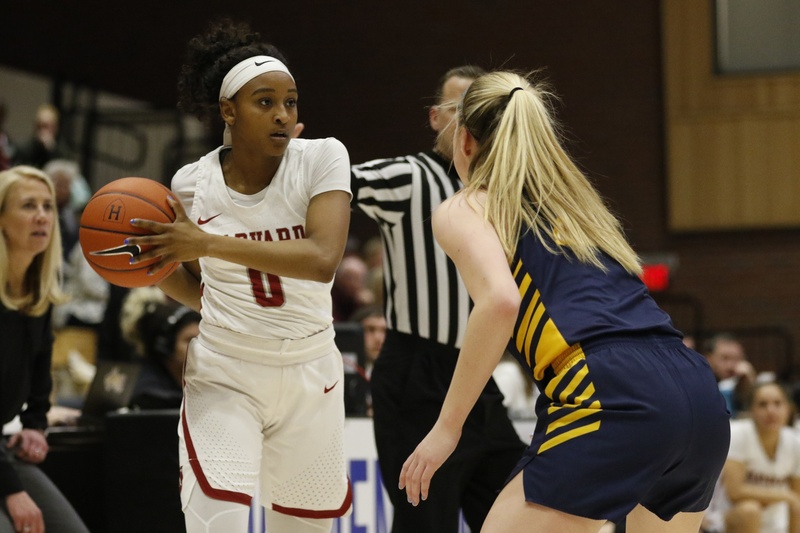 Harvard’s renewed confidence showed immediately in Friday night’s first-round win over Drexel, as it accelerated to a 20-point first quarter to complete a wire-to-wire, 69-56 victory. The bounce-back result means that the Crimson will play at least one more game at Lavietes Pavilion, challenging Georgetown on Sunday at 3PM. After shooting just 27.3 percent from deep against the Quakers, Harvard returned back to its regular form, knocking down 10 triples across 21 attempts. This came even against a Dragons team that held the top scoring defense in the nation. 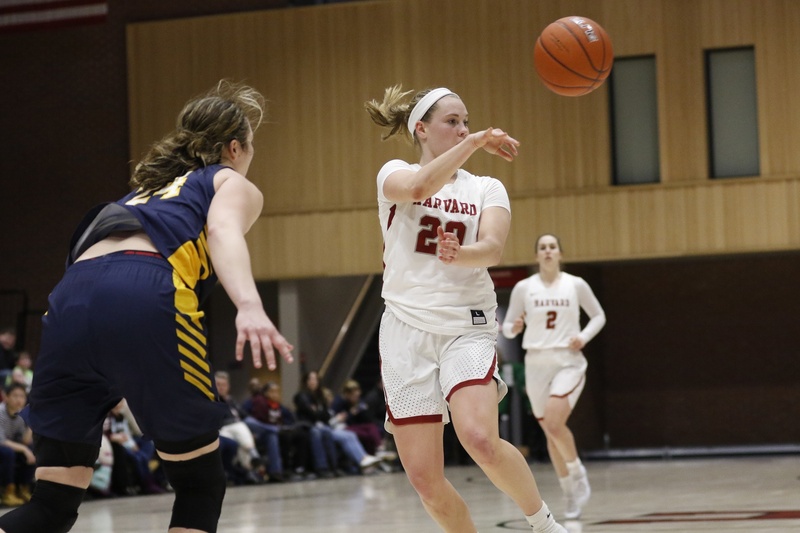 Conceding just 49.9 points per game prior to its bout with the Crimson, Drexel also saw its season-long streak of holding opponents to under 60 points in regulation end on Saturday. Madeline Raster was one of four Crimson players in double-digits on the evening. Harvard showed its fighting spirit across various metrics, including out-rebounding the Dragons 42-31 and tallying 26 points in the paint. Hitting a total of eight triples in the first half — four of which came from the fingertips of Benzan — the Crimson offense flowed from all cylinders in the early onset. A three from senior Madeline Raster pushed Harvard to a 25-17 lead to kick off the second quarter, and two more triples from classmate Sydney Skinner and Benzan widened the margin to double figures entering halftime. Harvard also held Drexel’s leading scorer Bailey Greenberg to just two points entering halftime intermission, while counterpart Niki Metzel was held scoreless in the first two stanzas. The Dragons shot just 3-of-14 in the second quarter, with only one player in double figures at that point. Senior Nani Redford saw two triples connect early in the third quarter. Sophomore forward Jadyn Bush had a comeback performance of her own, earning a double-double with 12 points and 13 boards. The Federal Way, Wash., native made her mark against a scrappy Dragons team, one that committed 16 personal fouls on the night. The Crimson was near-perfect at the line, shooting 90 percent. The host side’s streaky shooting settled down in the third quarter, but not before Redford added two triples of her own. However, right when that early push seemed to suggest the Crimson could pull away, the Dragons embarked on a 13-2 rally to bring the score back a one-possession contest with four to play in the third quarter. This time, it would be aggressiveness inside that helped the Crimson re-claim a more comfortable lead, as lay-ups from junior Jeannie Boehm, Skinner, and Bush to start the final quarter put Harvard back in front by 10. This formula of attacking the basket was critical to make-up for a suddenly-cold 2-for-9 mark from beyond the arc in the second half. The Crimson matched every late effort by the Dragons to draw it close, and finished the win in front of an energetic home crowd. Four Crimson players finished in double-digits, led by Benzan’s 18 points. On the opposite side, Greenberg was held to eight points while Aubree Brown picked up some slack with 16 to her name. This win marks the fifth time in program history that Harvard will advance to the second round, and the first WNIT game it has hosted at Lavietes Pavilion. The Sunday afternoon matchup with the Hoyas puts the Crimson in a position to face Penn for the fourth time this season. If both the Crimson and Quakers can pull their weight, Round Three of the NIT will undoubedtly be a must-watch revenge game. But for now, it is a much happier locker-room for Delaney-Smith’s side and another opportunity to play basketball at home for the seniors. — Timothy R. O’Meara, a Crimson multimedia executive, contributed quotes for this article.